Samira Hayat is following her calling: She has been a member of the Mobile Systems research team at the Department of Networked and Embedded Systems since 2012. Before that, she studied in Trento. Many years have passed since she left the “comfort zone” of her home country Pakistan and embraced the challenge of finding her way around new cultural spheres. Hayat is no stranger to leaving comfort zones behind. In doing so, she continues to discover new delight in her work and life. Hayat’s research explores networks of drones. Drones that perform aerial patrols of vast areas and solve complicated tasks often rely on a large number of individual helicopters, which have to cooperate and communicate. This requires network technologies. Compared to networks located at ground-level, experience has shown that the demands posed by the airspace represent a far more complex challenge. In order to rescue a casualty buried by an avalanche, the drones must locate the person very quickly, but must also pass the information on to the emergency services rapidly, so that they can act without delay. Taking turns, a pronounced practical orientation and theory both tend to feature strongly in Samira Hayat’s work. Listening closely while she speaks, a clear impression emerges that the right diversion and challenge always came at exactly the right time. 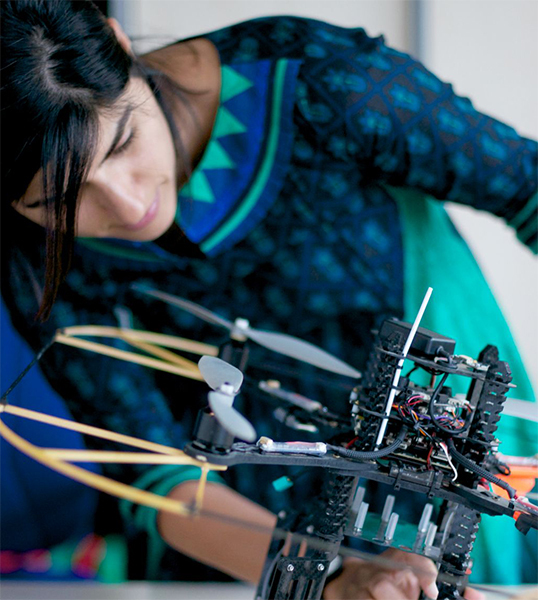 Having long held an interest in mathematics and physics, she chose a rather abstract degree in electrical engineering, as mechanical engineering was less highly regarded in Pakistan at the time. “Electrical engineering has a lot do with using your imagination and less with physical devices. When I compared my decision with other options, it was precisely this challenging abstract aspect that drew me to electrical engineering“, Hayat explains. Ultimately, it proved to be the right decision. Concentrating on the networks of drones allowed her to benefit significantly from “learning by doing” when she first came to Klagenfurt. The experiments were very closely linked to the hardware, and experience showed that the little helicopters do not always obey the commands they are given. Hayat has spent the past year at her desk engaged in theoretical work. She is close to completing her doctoral thesis. This spring, Hayat will be spending four months as visiting researcher at the prestigious Carnegie Mellon University, Pittsburgh. She is looking forward to becoming acquainted with new approaches and to presenting her own research results. Once more, Hayat is on a journey; one of her great passions alongside cooking and spending time with friends. “I have always wanted to travel the world”, she says. Hayat grew up as one of seven siblings; her father is a doctor. Her four sisters also chose to become doctors, following their father’s wish. One brother qualified as a pilot and another brother is currently pursuing an engineering degree. Hayat finds it hard to imagine returning to her native country one day, and following a traditional path involving marriage and family. However, she is keeping an open mind: “Anything could happen. I try to be as flexible as possible, and that demands a lot of energy. But I think this is a better use of energy than when it is invested in making plans, which end up being thrown overboard.” This also applies to the time after her doctoral studies: It remains to be seen what will seem important and right at the given time. An academic career, a position in industry, or starting a business venture – the possibilities are endless.